Kuala Lumpur - M.E Malaysia is set to bring the charming and talented Korean-American Kpop aritste, Eric Nam to Malaysia's shores this October under "F.Y.I On Stage", a series of events which introduces and highlight talented undiscovered artists. "F.Y.I On Stage with Eric Nam" promise a cosy, intimate show with a smaller but exclusive crowd. The event setup allows the artist to interact closely with the fans and to go beyond normal performances that Korean music fans are used to. Originally discovered via YouTube, Eric Nam first appeared on Korea MBC's singing competition, "MBC Star Audition : Birth Of A Great Star 2", after the show came across Eric's video and offered him a live audition in South Korea. Despite his role at the time as a non-profit fellow in India, he seized the opportunity to pursue his lifelong dream of becoming a singer and quickly made his way to the Seoul audition. Throughout the competition, Eric continuously exceeded expectations and impressed critics with his live performances. His impressive run finally came to an end as he placed in the Top 5 out of over one million hopefuls and signed to B2M Entertainment as a solo male singer. Eric is currently active as a co-host and emcee of Arirang TV's popular show "After School Club", a reporter for MBC "Section TV" and a regular guest on MBC's Radio "Song of Hope at Noon with Kim Shin Young". 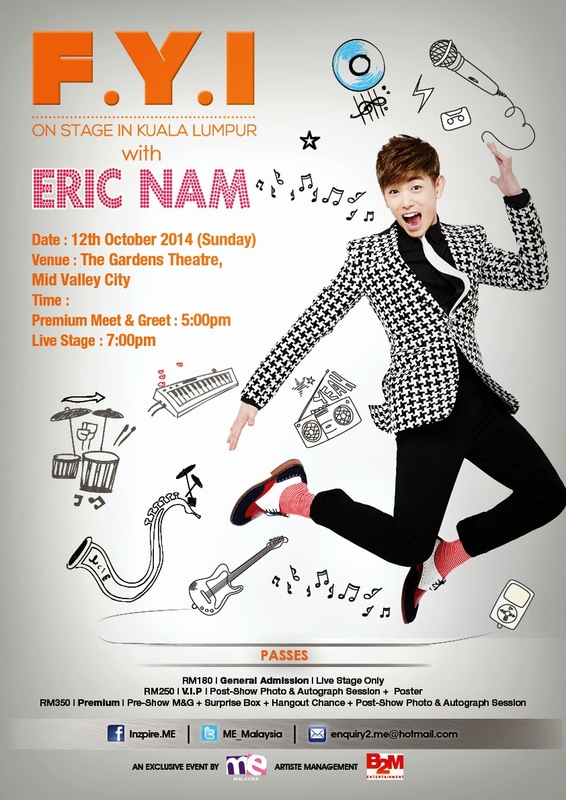 "F.Y.I On Stage with Eric Nam" will take place in Sunday, 12th October 2014 at The Garden's Theatre, Mid Valley City. General admission (RM180), V.I.P (RM250) and Premium (RM350) passes are available now in limited quantity. For more information on how to secure your passes, log on to http://www.facebook.com/Inzpire.ME or email M.E Malaysia at enquiry2.me@hotmail.com . F.Y.I On Stage is a series of events created by M.E Malaysia which introduce and highlight talented artists who have been at the forefront as influential pioneers in New Media with the hope that they will inspire young people to pursue and live their dream.